It isn’t nearly as familiar as the actor’s struggle, but it can’t be easy making a living as a clown these days. The big traveling circuses are all gone, which leaves children’s birthday parties and perhaps the occasional baby shower, which can’t amount to much. Kids are probably less entertained in general by clowns in this age of Candy Crush and scary clown stories in the news. 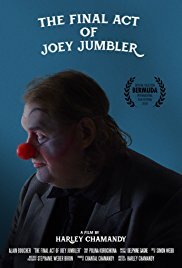 The title character in the short film The Final Act of Joey Jumbler is very far from scary, however; he’s more reminiscent of old-fashioned clowns like Emmett Kelly, a lost soul with whom you just want to share your last sandwich. Joey and his red nose face the world. At least, you do unless you’re some of the people who employ Joey (Alain Boucher) — one such wealthy family, who apparently hired him to entertain three kids during a regular family dinner certainly disprove the old adage that all the world loves a clown. The children are unsurprisingly a bit spoiled but it’s the grownups in the family that you’ve really got to watch out for. But Joey bears his troubles stoically and gets through his day as best he can, walking through the streets in his clown makeup and a battered old suit, hauling behind him the suitcase that holds his balloons and other props. It’s a strange existence, forcing him to move between resigned acceptance and the effervescence of his entertainer persona without warning, but he finds his small joys wherever he can. Chief among those is seeing his daughter Mathilde (Leanne Labelle) at the end of the day, the one thing that makes all the struggle worthwhile. But as the title implies, Joey may not be able to maintain the precarious balance of his life much longer, and his stoicism might not get him through everything. The sad clown is a tale far older than Pagliacci, but that doesn’t make Joey’s story any less heartbreaking or the way he faces his situation any less poignant. Boucher plays his role beautifully, neither falling into despair or tipping into mania, and there’s a subtle pain in watching him hold himself together even when it seems as though all he wants is to fall apart. Writer-director Harley Chamandy does both jobs expertly, creating a small gem of a film that’s quietly, wonderfully moving.